Obama administration official Susan Rice says that we should expect that some assets unfrozen in the Iranian nuclear deal will fund Iran’s “bad behavior.” This behavior includes bomb attacks by Hezbollah against Israel. This acknowledgment is an illustration that it’s okay for the federal government to allow piles of money to flow to Iran. But if you as a private citizen sent just enough money to Iran to buy a Persian rug or a can of pistachio nuts, you could be prosecuted or fined. The hazards of funding Syrian fighters have been clear for years, and the resurgence of ISIS should eliminate any temptation to fall in love again with the myth that we can identify “safe” partners in Syria and ensure that the money and arms we give them stay exclusively within their hands. Would arming Syria’s rebels have stopped the Islamic State? Former secretary of state Hillary Rodham Clinton made news this weekend by suggesting that the rise of the Islamic State might have been prevented had the Obama administration moved to more aggressively arm Syrian rebels in 2012. Variants of this narrative have been repeated so often by so many different people in so many venues that it’s easy to forget how implausible this policy option really was. It’s easy to understand why desperate Syrians facing the brutal regime of Bashar al-Assad hoped for Western support, especially by early 2012 as the conflict shifted inexorably from a civic uprising into an insurgency. It is less obvious that U.S. arms for the rebels would have actually helped them. Arming the rebels (including President Obama’s recent $500 million plan) was, from the start, a classic bureaucratic “Option C,” driven by a desire to be seen as doing something while understanding that there was no American appetite at all for more direct intervention. It also offered a way to get a first foot on the slippery slope; a wedge for demanding escalation of commitments down the road after it had failed. There’s no way to know for sure what would have happened had the United States offered more support to Syrian rebels in the summer of 2012, of course. But there are pretty strong reasons for doubting that it would have been decisive. Even Sen. John McCain was pretty clear about this at the time, arguing that arming the rebels “alone will not be decisive” and that providing weapons in the absence of safe areas protected by U.S. airpower “may even just prolong [the conflict].” Clinton, despite the hyperventilating headlines, only suggested that providing such arms might have offered “some better insight into what was going on on the ground” and “helped in standing up a credible political opposition.” Thoughtful supporters of the policy proposed “managing the militarization” of the conflict and using a stronger Free Syrian Army as leverage to bring Assad to the bargaining table. Syria’s combination of a weak, fragmented collage of rebel organizations with a divided, competitive array of external sponsors was therefore the worst profile possible for effective external support. Clinton understands this. She effectively pinpoints the real problem when she notes that the rebels “were often armed in an indiscriminate way by other forces and we had no skin in the game that really enabled us to prevent this indiscriminate arming.” An effective strategy of arming the Syrian rebels would never have been easy, but to have any chance at all it would have required a unified approach by the rebels’ external backers, and a unified rebel organization to receive the aid. That would have meant staunching financial flows from its Gulf partners, or at least directing them in a coordinated fashion. Otherwise, U.S. aid to the FSA would be just another bucket of water in an ocean of cash and guns pouring into the conflict. Meanwhile, huge private donations from the Gulf flowed toward mostly Islamist-oriented groups. These were massive public mobilization campaigns, mostly led by popular and ambitious Islamist figures who framed support for Syria along religious and sectarian lines in increasingly extreme ways. (Incidentally, the magnitude of those campaigns reveals the absurdity of recent claims that Arabs had ignored Syria’s war compared to Gaza.) Kuwait became the key arena for collecting money, as other Gulf states more tightly controlled private donations for Syria, but Islamists from across the region and especially Saudi Arabia continued to play a prominent role in the campaigns. Fears of jihadist blowback have led Gulf states to crack down on these private efforts, including Kuwait’s recent stripping of the citizenship of Nabil al-Awadhy, one of the most prominent of these Syria campaigners. But at the time Clinton’s plan was under discussion, those campaigns were peaking, with massive public support built around Islamic and sectarian identity. That intra-state competition and popular mobilization is the regional context within which U.S. efforts to arm the FSA would have unfolded. The FSA was always more fiction than reality, with a structure on paper masking the reality of highly localized and fragmented fighting groups on the ground. Charles Lister’s comprehensive recent survey of the current Syrian military battlefield should quickly dispense with the simpler versions of the conflict. Syria’s civil war has long been a dizzying array of local battles, with loose and rapidly shifting alliances driven more by self-interest and the desires of their external patrons than ideology. Even at the height of the conflict between the Islamic State and its more secular rivals, local affiliates fought side by side in other theaters of the war. No one should be surprised that, as Hassan Hassan reports, some U.S.-backed and vetted groups have aligned with the Islamic State. The idea that these rebel groups could be vetted for moderation and entrusted with advanced weaponry made absolutely no sense given the realities of the conflict in Syria. These local groups frequently shifted sides and formed alliances of convenience as needed. As MIT’s Fotini Christia has documented in cases from Afghanistan to Bosnia, and the University of Virginia’s Jonah Shulhofer-Wohl has detailed in Syria, rebel groups that lack a legitimate and effective over-arching institutional structure almost always display these kinds of rapidly shifting alliances and “blue on blue” violence. A “moderate, vetted opposition” means little when alliances are this fluid and organizational structures so weak. Many have argued that the United States might have changed all of this by offering more support for the FSA. But based upon his outstanding recent book “Networks of Rebellion,” the University of Chicago’s Paul Staniland urges caution. Initial organizational weaknesses have long-lasting implications. “Pumping material support” into them, he observes, “might buy some limited cooperation from factions that need help, but is unlikely to trigger deep organizational change. This means that foreign backing for undisciplined groups will not do much.” Syria’s famously fractured and ineffective opposition would not likely have been miraculously improved through a greater infusion of U.S. money or guns. Jimmy Carter—Carter accepted $1 million from the Bin Laden family for his Carter Center presidential library. Carter also received a multi-million dollar loan in the late 1970s to save his peanut business—a loan which was backstopped by BCCI, the Pakistani-operated, Persian Gulf-funded bank that became embroiled in international corruption scandals and was ultimately shut down. BCCI officials had relationships with Osama Bin Laden, gave nuclear secrets to Pakistan, and served as the depository for money made off the Arab oil embargo. Bert Lance, a Carter administration official and close personal friend of Carter’s, was forced to resign during Carter’s presidency for improper banking relationships with BCCI. More recently, Carter refused to give back a donation from the Zayed Foundation, an anti-Semitic, anti-Israeli, Saudi group, even after Harvard University had refused to accept a donation from the same foundation. Several observers have concluded that the funding has influenced Carter’s increasingly harsh views and references to apartheid when describing Israel. 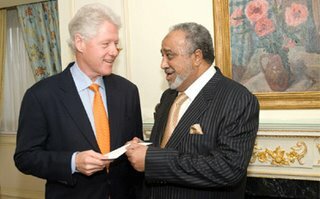 Bill Clinton—The Clinton Foundation accepted a gift of at least $1 to $5 million if not $20 million from billionaire oilman Sheikh Mohammed H. Al-Amoudi. Saudi Arabia itself gave between $10 and $25 million shortly before his wife became secretary of state, with Kuwait, Qatar and Oman each giving between $1 to $5 million. These donations followed earlier millions that flowed from the Saudi royal family to the Clinton library in Arkansas. In her dealings with the Islamic world as secretary of state, Hillary Clinton neglected to pursue an agreement with Iraq to provide for its ongoing security needs after the withdrawal of American troops, and she pressed for negotiations with the Taliban in Afghanistan—two decisions which coincidentally aligned with the desires of Saudi Arabia. Al Gore—Gore personally made about $100 million from his share of the sale of the Current TV network to the Qatari-controlled sensationalist and anti-Semitic network Al Jazeera. The $100 million windfall makes the Saudi gifts to Jimmy Carter look like, well, peanuts. The purchase gave Al Jazeera its long awaited entre to American audiences, along with some air of legitimacy by being praised by the former vice president after the sale. Qatar has been a primary bankroller of the radical fighters of the Arab Spring, and Al Jazeera has been its cheerleader. The Shiites, secularists, and Christians are suffering from Qatar’s activities, but Al Jazeera and Al Gore have made out like bandits from the transaction. Although Gore was highly outspoken against the war in Iraq, he has been fairly quiet about American involvement in Libya and Syria—involvement which is supported and encouraged by Qatar. A cynic may wonder whether Gore’s silence was purchased. John Kerry—When Kerry ran for president in 2004, Iranian-American donor Hassan Nemazee gave him $100,000. Nemazee had served earlier on the board of the pro-Khomeini American Iranian Council. Kerry signaled during the campaign that he would pursue areas of mutual interest with Iran, and complained that George Bush didn’t give Iran “nuclear fuel” to see whether or not Iran would use it peacefully. As secretary of state, Kerry has pursued diplomatic negotiations with Iran in Geneva despite Iranian President Rouhani’s history of deceiving the West about Iran’s nuclear program. Eventually, Hassan Nemazee pleaded guilty and was sentenced to 12 years in prison for defrauding banks with phony collateral to borrow money to finance his Democrat fundraising activities. Nemazee also served as a fundraiser and adviser to Hillary Clinton before going to prison. Barack Obama—Before he was elected, there were allegations that Barack Obama got help as a student from Saudi agent Khalid al-Mansour for law school expenses and as an adult from sweetheart deals by Syrian-American real estate developer Tony Rezko. Like Kerry and Hillary Clinton, Obama also received campaign donations from Hassan Nemazee. Donations totaling $30,000 were made to the 2008 Obama campaign from two brothers in Gaza in violation of campaign finance laws; the donations were said to be returned after the donations became public. California businessman Kareem Ahmed was a “million dollar donor” to the Obama campaign and Democratic causes in 2012, and his offices were raided by the local district attorney last year. A lot of the donors here are anti-Semitic, and they are supporting these politicians because they believe they can help them undermine Israel’s security. Saudi Arabia in particular has a long history of trying to buy elections around the world, not only supporting Wahhabi causes and groups, but “secular” and mainstream entities such as universities and philanthropies in order to curry broad institutional favor from the West. These cases, even if the money had zero influence on the politicians in question, illustrate the great lengths to which wealthy Arab donors and sometimes pro-Iranian donors will go in an attempt to influence U.S. politics and foreign policy in their favor. Another loophole has materialized in Pres. 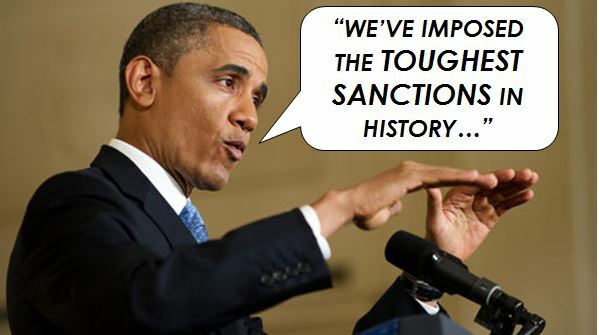 Obama’s “toughest sanctions ever.” Not that it really matters when we’re offering $20 to $50 billion in sanctions relief anyway if Iran agrees to scale back on its nuclear program somewhat. By the way, if bitcoin can help businesses in Iran to skirt international sanctions, can’t bitcoin help Hezbollah as well? An interesting e-commerce site that went online just last week is accepting bitcoin only, because most overseas customers cannot pay with anything else. The business is Persian Shoes, an over 70-year-old business selling handmade footwear. It is located in Isfahan, the third-largest city in Iran. The owners are happy to ship anywhere, but paying them is a problem. Thanks to the vagaries of international diplomacy and the past few decades of history, the usual e-commerce channels are blocked. Trade sanctions against the entire country of Iran by the United Nations, United States, European Union and others mean Western Union and major credit card companies will not deal with Iranian businesses, even those in the fashion world. The only way to pay someone in Iran is with cash carried in your pocket – or some easily transferrable, mostly unregulated, digital currency. The bitcoin-only store sold four pairs of shoes in its first day of business. “To my standards it is a good sale!” said the CEO, Mor Roghani. The store’s success continued throughout its first week. “We have sold ten pairs of shoes so far using bitcoin. This is way above our expectations,” he added. Persian Shoes is currently operated by three brothers, who are keen to expand the business their father started. Roghani’s cousin, who lives in Australia, introduced them to bitcoin and helped them to set up the site. The site currently offers leather handbags, purses and shoes for women and seven varieties of shoes for men. Prices are all listed in USD and start around US $80. Our business is making and selling leather products. We like to sell our products across the world and the more customers the better. The problem is we operate in Iran and most payment systems either are not willing to serve us at all or impose a huge risk on our business. Before launching this website, our international sale has been limited to a few dedicated customers who knew about the quality of our products and were prepared to go through a lot of trouble to pay us! This of course, may sound incomprehensible for people who have all sorts of electronic payments at their disposal. However, before finding out about bitcoin, receiving our money was the number one obstacle in expanding our business. As well as international trade restrictions, exchanging bitcoin back into local currency (Iranian Rials) also faces knowledge and technical barriers. “Exchange is a bit tricky because bitcoin is not common yet. We are planing to hold onto some of the bitcoins and sell some at localbitcoins,” Roghani said. A lack of online shopping culture locally and poor internet connectivity hinders trade with other parts of Iran. Depending on your country of citizenship or residence, you may not actually be allowed to buy these shoes even with bitcoin. Just as Americans may not spend a weekend in Havana or enjoy real Cuban cigars, they are also forbidden to engage in any trade activity with businesses or individuals located in Iran. CNN is reporting lawmakers are speculating on the possibility U.S. agencies operating in the Benghazi compound attacked Sept. 11, 2012, were secretly helping to transfer weapons from Libya, via Turkey, to the rebels in Syria. That possibility was first reported by WND two weeks after the Benghazi attack, when the news agency cited Egyptian security officials who said murdered U.S. Ambassador Christopher Stevens played a central role in arming and recruiting rebels to fight Syrian President Bashar al-Assad. In November 2012, Middle Eastern security sources further described both the U.S. mission and nearby CIA annex in Benghazi as an intelligence and planning center for U.S. aid to the rebels, which included weapons shipments being coordinated with Turkey, Saudi Arabia and Qatar. The State Department told CNN it was helping the new Libyan government destroy weapons deemed “damaged, aged or too unsafe retain” but denied it was transferring weapons to other countries. The CIA would not comment to CNN on the weapons-transfer reports. Meanwhile, clarification on the weapons transfers may have inadvertently come through recent statements by a Libyan weapons dealer from a group hired to provide security to the U.S. mission in Benghazi. The dealer told Reuters he has helped ship weapons from Benghazi to the rebels fighting in Syria. The detailed account may provide more circumstantial evidence the U.S. Benghazi mission was secretly involved in procuring and shipping weapons to the Syrian opposition before the deadly attack that killed the U.S. ambassador and three other Americans. In an interview with Reuters published in June, Libyan warlord Abdul Basit Haroun declared he is behind some of the biggest shipments of weapons from Libya to Syria. Most of the weapons were sent to Turkey, where they were then smuggled into neighboring Syria, he said. Management of the failed gunrunning operation from Libya to Syria appears to have been since been transferred to Qatar. Promising to make it easier for Muslims to give zakat. Pres. Obama has tried to remove the so-called “chilling effect” that George W. Bush, the Patriot Act, the Treasury Department, and law enforcement “created” by closing down Islamic charities that funded terrorism. Rather than building on the Bush administration’s successful prosecution of the Holy Land Foundation for sponsoring Hamas, Obama won’t prosecute Islamic Relief, he won’t prosecute CAIR, he won’t investigate ISNA or NAIT, and the IRS has been derelict in stripping suspicious Islamic organizations of their tax-exempt status. Funding the Arab Spring that has led to the rise of Muslim Brotherhood dominated governments in the Middle East who behave against U.S. national security interests. Minimizing our energy independence from Middle East oil by reducing oil production on federal lands and waters, rejecting the Keystone XL pipeline, impeding hydraulic fracturing permitting, etc. Making little to no progress on bankrupting the Taliban. Dragging his feet in adopting sanctions against Al Qaeda and Taliban affiliates such as the Pakistani Taliban and the Haqqani network. Read the rest of this entry ?